As a lapsed science fiction fan, I find it frustrating (and not a little depressing) that in spite of the genre’s dominance of Hollywood and the increasing sophistication of CGI special effects, 2001: A Space Odyssey (1968) remains a formidable Everest. 2001 exists in a lonely mountain range with Blade Runner (Ridley Scott, 1982), Solaris (Andrei Tarkovsky, 1972) and, maybe, Brazil (Terry Gilliam, 1985) as examples of films that possess the formal and thematic sophistication of novels like Alfred Bester’s The Stars My Destination, Thomas Disch’s Camp Concentration, or Frederik Pohl and CM Kornbluth’s The Space Merchants. While I can understand the visceral appeal of “fanboy” favorites like Star Trek, Star Wars, and The Terminator, as I get older I prefer the “future is now” rigor and ambition of films like Atom Egoyan’s The Adjuster (1991), David Cronenberg’s Dead Ringers (1988), or Todd Haynes’ Safe (1995). These films do not appear to belong to the genre on the surface, but they confront the dizzying terror of technological change in a way more obvious titles fail to achieve. In 2001, Kubrick dealt with that terror, but he also balanced it with a genuine awe for the beauty and mystery of the universe. Given its reliance on image over dialogue, Chion’s words are a lyrical description of 2001‘s resonance and appeal to viewers who are usually indifferent to science fiction. 2001 transcends its genre limitations because of the scope of Kubrick’s preoccupations – the timelessness of human violence, the limits of language and reason, the beauty and madness of genius and obsession – and the director’s rare ability to articulate them through dense, almost iconic imagery. Chion, a French critic who has written imaginatively and perceptively about Jacques Tati and David Lynch, packs a lot of proverbial food for thought in his 194-page book. 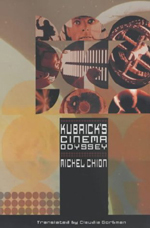 In the early sections, he lucidly outlines the relevant aspects of Kubrick’s career (pre and post-2001) as well as the contextual streams – the cold war, the ’60s counter-culture, the low status of SF films pre-’68 – that informed the production of the film. This background helps to remind us just how radical the making of 2001 was not just in terms of mainstream commercial cinema, but in the ways it clearly established Kubrick as an auteur as important as Antonioni and Bergman were in the ’60s. Then Chion quite rightly asks the reader to shift gears and forget about context and look at just what he or she sees when the film unspools. In the rush to embrace one theory over another, film criticism often forgets that that the evidence of the senses can be an important tool in finding new meaning in a “classic” film text. After his look at 2001‘s dissonant yet poetic structure, Chion takes us through the film’s style with signifcant attention to the way shot/reverse shot is used. Until reading Chion’s book and reviewing 2001, I hadn’t realized the extent to which Kubrick keeps the two astronauts apart until their fatal meeting in the room in which Hal spies on their conversation. The omnipresence of physical spaces in relation to individuals in Kubrick’s films reaches its zenith in 2001, but what makes that reality unbearable is the awareness that beyond the cold walls of the Discovery space ship or the claustrophobic confines of the pod is the limitless nothing of “outer space.” The two astronauts on the Discovery exist in a mini-world of bright technological order blissfully unaware that they are not on a mission but a collision course with a universe that is lonely and unknowable. Chion’s book does not pretend to answer or crack 2001‘s many “unknowables”. Its ultimate value lies in having us approach already familiar debates about the film in a new way. My only real quibble with this book is its final chapter, a tantalizing, but all too brief examination of Eyes Wide Shut (2000) as “the reverse and complement of 2001”. Whereas 2001 is an odyssey through the limitless frontier of outer space, Eyes Wide Shut is a journey through the all too familiar territory of man-woman relationships. Both films take us through spaces that are seemingly familiar, enigmatic, and beautiful to behold. In creating these landscapes, Kubrick was driven as much by intuition as intellect and it is to Chion’s credit that his study of 2001 allows the reader to do the same in revisiting a great film.